We don’t usually think about it, but we live in a finite world. In other words, in theory we can count precisely how many atoms make up the earth. We can also theoretically count how many humans live on earth and how many of any other species live on earth at a particular point in time. At some point, in a finite world, we start reaching limits. There are now about seven billion people in the world. We could probably add some more, but how many? What is it that limits our ability to add more people to the world we live in today? One obvious guess as to what might limit world population is the amount of fresh water that is available. If we don’t have enough fresh water available, we can’t continue to expand population. The amount of fresh water that is available can be changed, though, by adding desalination plants. There are many other ways of getting fresh water. To give an extreme example, the amount of fresh water available could be increased by melting ice in Antarctica and importing it by ship. Either of these solutions would require energy in an appropriate form—either to run the desalination plant, or to melt the ice and transport it by ship. Thus the fresh water shortage, at least for the foreseeable future, can be worked around if there is sufficient energy available of the right type. The other not-so-minor detail is that the cost of desalination or of importing melted ice from Antarctica needs to be inexpensive enough that users of fresh water can afford it. In order for this to be the case, the cost of the appropriate type of energy must be extremely inexpensive. We can think of other kinds of limits to population growth as well. For example, carbon dioxide limits. In theory, there are ways around carbon dioxide limits. For example, assuming current research projects are successful, we can build carbon capture and storage facilities and change our electricity generating plants so that the carbon dioxide that is emitted can be captured and stored underground. Here, too, there are energy limits and cost limits. Carbon has a molecular weight of 12, while carbon dioxide has a molecular weight of 44. Because of this, if we create carbon dioxide from coal, the carbon dioxide we produce is much heavier and bulkier than the coal that we burned to make the electricity. It will take a lot of energy to store this gas underground in a suitable place. Thus, we have another problem that can be handled, if there is enough cheap energy of the right type available. Almost any kind of obstacle to increased human population that we can think of has an energy-based work-around. Will people be so crowded that disease transmission will be a problem? There are workarounds: better water treatment plants and sewer treatment plants, especially in the poorer parts of the world; more immunizations; more and better hospitals; antibiotics for all those who need them. These solutions also require energy, as well as other inputs (which indirectly require energy as well). The difficulty is making them affordable for the people who need them. If the problem is not enough food, perhaps because of degraded soil, there are energy-based workarounds as well. Food can be imported from a distance. More fertilizers and soil amendments (either made using fossil fuels, or transported using fossil fuels) may be used. Irrigation, which uses either diesel fuel or electricity to pump water may be used to pump water to too dry areas, to increase food production per acre. In some cases, artificial soil can be created, and plants grown in a green house—again requiring much energy. The issue again gets to be whether consumers can afford the food produced using this more energy-intensive procedure. Degraded resource supplies occasionally run out—for example, an aquifer may run dry. A more common situation, though, is that resources become progressively more expensive to extract as we approach limits. We tend to extract the easiest to extract (and thus cheapest-to extract) resources first. These resources are the highest quality ones, in the easiest to access locations. We then move on to more expensive to extract resources. A similar pattern applies to many types of resources, including ore used in making metals, oil, gas, coal, and uranium. When we analyze resources of a given type, say uranium, we find that there are always more resources available. The problem is that they are increasingly expensive to extract because the ore is of lower concentration, or is located in a harder to reach area, or there is some other problem involved. We have illustrated this situation in Figure 1, as a triangle with a dotted line at the bottom, because of the uncertain cut-off regarding how much is available. The cut-off is really a price cut-off. At some point, the resource becomes too expensive for customers to afford products made with it. Figure 1. Triangle of available resources, with dotted line indicating uncertain financial cut-off. 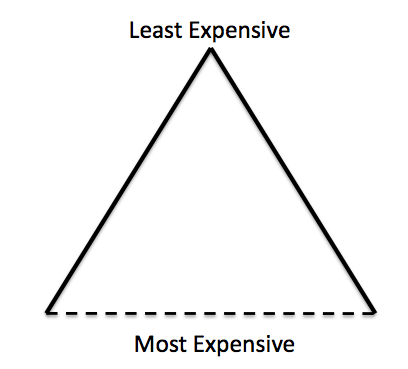 A company starts from the top of this triangle, extracting whatever resource is involved. A company can “see” a little way ahead, as it looks down toward the bottom of the triangle. The company will report reserves which are continually increasing because the width of the triangle keeps getting wider, even though these reserves are of lower quality and can only be extracted in a more energy-intensive way. The question then becomes whether customers can really afford products made with these expensive-to-extract resources. Energy is pretty amazing. Energy is what allows work of any kind to be done, from making a clay pot by hand, to baking a cake, to creating a carbon capture and storage facility. Humans by themselves are able to produce some energy, because of the food we eat. But we are also able to leverage the energy that our own bodies produce with energy from other sources, such as from burning biomass. We learned to burn biomass a very long time ago, over 1,000,000 year ago. If humans were like other large primates, there would be only 100,000 or 200,000 of us, rather than 7 billion of us. We would live in an area to which we are biologically adapted, most likely a very warm part of Africa. Humans’ population is much higher, because once we learned to control fire, we were able to settle areas of the world that would otherwise be too cold or dry to live in, and we were able to increase population densities through energy-related techniques we developed. One thing we learned to do was cook part of our food supply. This had many advantages. Unlike apes, we no longer needed to spend literally half of our day chewing. This freed up time for other activities, like tool-making, hunting, and clothing making. It also allowed the human body to evolve in a way that allowed a bigger brain and smaller digestive organs. Gradually we used our improved brain to develop other techniques such as making heat-tempered stone tools, which were sharper than other stone tools, and teaching dogs to help us with hunting for food. All of these approaches to using external energy allowed humans to leverage our own puny energy supply from food with energy supply from other sources and gain an advantage over other animals. Human prosperity was able to increase and population was able to grow as we learned to use increasing amounts of energy from outside sources. Energy sources we gained control over included domesticated plants and animals, facilitating agriculture. World population by the year 1 C. E. reached 200 million, or over 1,000 times the population level before the leveraging impact of external energy supplies began enabling greater human world population. 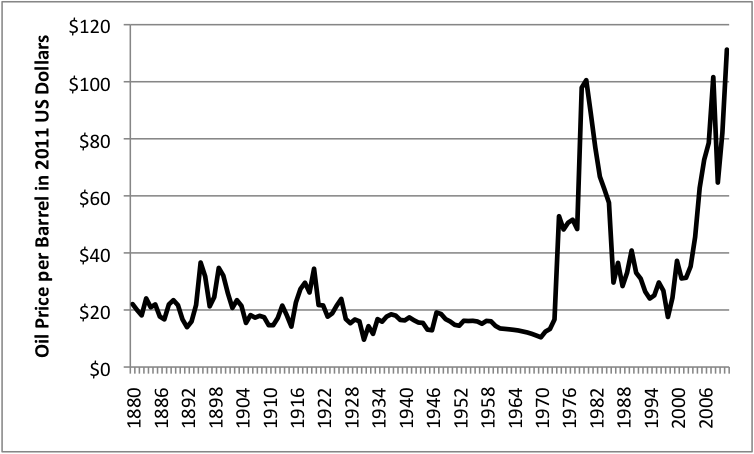 Fossil fuel (coal, oil and natural gas) use became common after about 1800 C. E., and population grew very quickly. 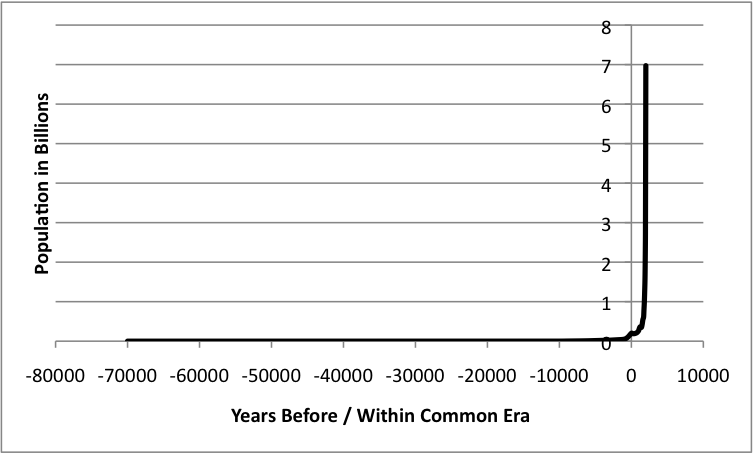 In fact, when population is graphed, it looks like it went straight up starting when fossil fuels were added. Figure 2. World population based on data from “Atlas of World History,” McEvedy and Jones, Penguin Reference Books, 1978 and Wikipedia-World Population. Use of fossil fuels did not grow by themselves. Their use was facilitated by the development of improved technology, which provided the vehicle for their use. Increased debt also facilitated fossil fuel use, because it allowed potential buyers to afford the new products being developed, and provided companies doing energy extraction funds for their work. Our ability to do physical work using human labor is quite limited. For example, if we want to dig a well for water, the depth that humans can dig without the assistance of a machine intended for this purpose is only about 20 feet. With mechanical drilling equipment, typically powered by oil, we can quickly and cheaply dig a well many hundreds of feet deep. As another example, if we want to transport goods a long distance without external energy, we can only push a cart at the speed at which we can walk. Oil or another other modern fuel allows inexpensive long-distance transport of goods. 1. Costs are typically reduced when fossil fuel energy or electricity from any source can be substituted for human energy. This allows greater leverage of the energy of the remaining humans doing the “work”. 2. Costs tend to increase, as the cost of the energy source in (1) increases. Such an increase in costs occurs as we approach limits of a finite world, partly because extraction is from more depleted resources (farther down in the resource triangle shown in Figure 1), and partly because we reach increased problems with pollution, such as the BP Deepwater Horizon well blowout in 2010. The cost of mitigating pollution problems also adds to energy costs. Up until about the year 2000, this tug of war had a favorable outcome. An increased amount of fossil fuel energy was substituted for human energy, leading to lower costs. As mentioned previously, improved technology and additional debt enabling this substitution played a role as well. In recent years, the tug of war has started to go the other direction. The cost, particularly for oil energy, has tended to rise far more rapidly than costs in general (Figure 3). This has produced many dislocations within the economy, making countries that use a lot of oil less competitive in the world marketplace and reducing economic growth rates, especially among countries no longer able to complete. The higher cost of oil products reduces disposable income of citizen, leading to recession and to deficit spending by governments. Figure 3. Brent-equivalent oil price in current $, based on data from BP 2012 Statistical Review of World Energy. In future years, we can expect that two way tug on costs will increasingly be lead to higher costs, because of greater impact of limits of a finite world. This will tend to send economies increasingly into recession. Our financial system has been built assuming that economic growth will continue indefinitely. There is significant risk that the recessionary influences of high oil costs will bring down the current economy. We know from a recent analysis by Peter Turchin and Sergey Nefedov (Secular Cycles, Princeton University Press, 2009) that historically, when civilizations collapsed, they did so for financial reasons, as the cost of government became too great for citizens to fund with tax revenue. There would seem to be a significant risk that today’s economy will reach the same end. Why didn’t others recognize this issue? Reaching limits of a finite world is a subject that does not easily fit into any one subject area, so the subject tends to be missed by researchers concentrating on one field of study. The closest fit came in the analysis The Limits to Growth (Donella Meadows et al, Universe books, 1972). This analysis came very close, but did not quite hit the nail on the head because it missed the connection of debt to limits to growth. (The model was of course not expected to be complete.) More recent analyses along this line to miss the debt connection as well, pushing the likely date of collapse forward. There is much confusion about the question of what limits, such as oil limits, mean. Many people believe that rising oil reserves (which are a given when the problem is ever-more expensive to extract oil, as illustrated in Figure 1) mean that our oil problems are solved. Our problem is not a lack of oil reserves; our problem is that the selling price needs to keep rising, to cover the rising costs of extraction and to cover government dependence on tax revenues. This increase in selling price makes oil ever less affordable, which is our real problem. not be able to get enough tax revenue from oil operations to fund programs (food subsidies, for example) that prevent revolt. Why might I be able to shed light on the real impact of finite world limits? My background is as a casualty actuary, doing financial forecasting for insurance companies. Thus, I started with somewhat of a financial background, but did not have the usual “brainwashing” that comes when a person has studied the economy from the perspective of today’s economists. My background gave me a great deal of experience hunting for publicly available databases, making graphs, doing analyses, and explaining the results to lay audience. I got interested in the issue of oil limits and what impact they might have when read the book, The Empty Tank: Oil, Gas, Hot Air, and the Coming Global Financial Catastrophe (Jeremy Leggett, Random House, 2005). His view comes from the “peak oil” view, which is close to my view, but not quite the same. When I read Leggett’s book, it hit a responsive chord because I had had first hand experience with the impact that high oil prices had on insurance companies in the 1973-1974 period. In 1973, I was the actuary for a small insurance company that ultimately went bankrupt, at least partly because of the indirect impact of higher oil prices. Reporting to the president of the company, I got to see up close what kind of havoc high oil prices could cause in the financial world. After I read Leggett’s book, I started researching the issue on my own. I wrote an article for insurance executives in early 2006 and an article for actuaries in early 2007. In March 2007, I decided to take early retirement, and work on the issue full time. I set up my blog site, OurFiniteWorld.com in March 2007. I soon was asked to help with the website TheOilDrum.com, where I wrote under the name, “Gail the Actuary,” and made many contacts with others interested in the issue of limited oil supply. To make a long story short, over the past several years, I have made many contacts with researchers who have discovered at least part of the story of oil limits and energy limits. Through my blog posts, I also received much valuable input, including suggestions from readers regarding academic books that might be helpful. My work is now being published in the academic world as well. I wrote a paper, “Oil Supply Limits and the Continuing Financial Crisis,” published in the journal Energy in January 2012. It has so far been cited by 10. I was also a co-author of “An analysis of China’s coal supply and its impact on China’s future economic growth” (Energy Policy, June 2013). My most recent publication is an article called, “Financial Issues Affecting Energy Security” in the soon-to-be published book, Energy Security and Development–The Changing Global Context, (B. S. Reddy and S. Ulgiati Eds., Cambridge Scholars Publishing, 2013). This entry was posted in Book draft, Financial Implications, Introductory Post and tagged energy limits, financial limits, limits to growth, oil limits. Bookmark the permalink. Yes, Don, I agree. In fact, the only thing about GDP that interested me in that study was the slight dip at the beginning of the computational experiment. What is important, though, is the exponential growth in the energy budget required by a society with a constant energy per capita (corrected for conservation). Now, how do we get standard of living to stay constant? We are at liberty to set it constant in the computation. In real life, it would not remain so. I’ll admit that the program is hard to follow unless you are willing to press every button I ask you to in the detailed instructions for each experiment. I coded Newton’s method in MS Excel by compiling the partial derivatives incrementally. Thus, quite a bit of analytical ingenuity is wasted if no one can follow it. At the time I was working on it, I was so immersed in it that every control key was second nature. When I look at it now, I wonder how I wrote it. Nonetheless, the conclusions are valid; and, if the choices for ERoEI of fossil fuel and renewables are something like the reality, we can expect enough energy in a planned economy but not in a market economy. This is not a popular conclusion here in the USA where establishment powers have manufactured consent to a monstrous system. Indeed, the most compelling argument against markets is a moral argument; but, for Machiavellian minds, the energy argument might be best.